Set in Victorian England, Wilde's classic satirical comedy follows two bachelor friends, who create fake identities in an attempt to court two delightful young ladies. As things begin to go awry with their master plan, the gentlemen must grapple with the uproarious consequences of their deception. 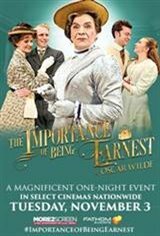 Hilarity ensues as aristocratic attitudes, romance, fortunes, double lives, and honor collide in this clever tale.One of Britain's most respected actors, David Suchet, leads the stellar West End cast in this eternally popular play. Don't miss this one-night opportunity to experience the stunning production and celebrate the 120th anniversary of this theatrical treasure.